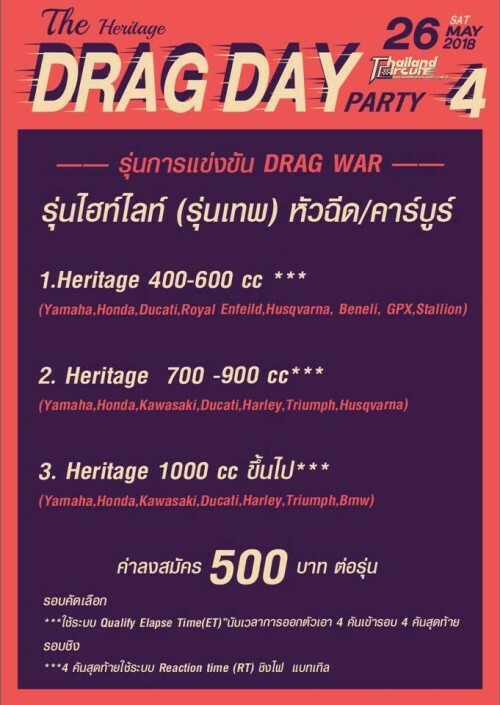 DRAGDAY PARTY THE HERITAGE & HELL ON DIRT Starts Satuday at 9am on the 26th May at Thailand-Circuit-Nakornchaisri. Entry is by Donation. This is an annual Biker Event and well worth the ride from Koh Samui. 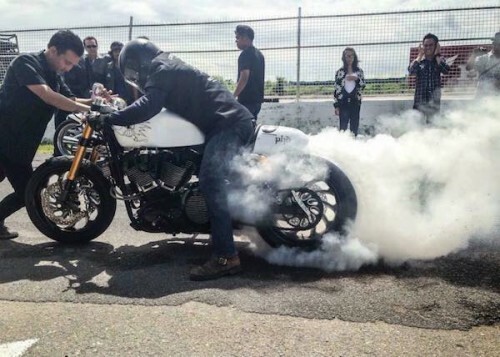 "Oil smell, engine noise" And everything your girlfriend does not like. " 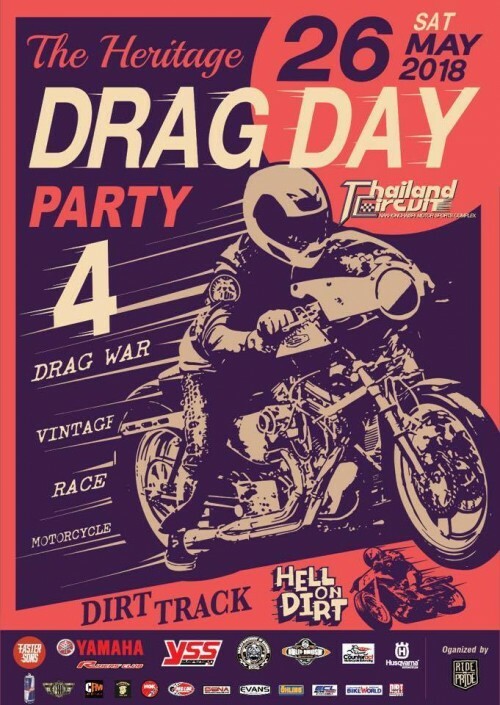 We come back After a one year vacation, we will take you back in time to the 70's Drag Race, get dressed up and miss out on the 201m straight race and hell dust !, "Hell On Dirt". There is no limit to CC or brand. May 26th invite your brothers to unleash the dark power. ฌ The racecourse with the most atmospheric woodstock in Siam, then meet .... offline. เมื่อวาน ผม กับ น้าโด่ง ได้ไป รับ Mr. Tak shigematsu ที่สนามบินสุวรรณภูมิ ผมดีใจมากที่ มีนักแข่งระดับโลกให้ความสำคัญ ต่องาน Dragday Party คุยกัน เกี่ยว กับ รถแข่งของเค้าเจ้า “Blue Panther” รถแข่ง TopFuel Harley ใส่ Superchager ที่ความเร็วตอนเข้าเส้น เกือบ 400Km /H แรงดึงเกือบ 4G!!! Yesterday, me and I went to pick you up. Tak Shigematsu at suvarnabhumi airport. I'm very glad to have a world-class racer. Focus on the dragday party talking about his race car. "Blue Panther" race topfuel Harley wearing superchager at speed at the end of almost 400 km / h. Strong pull. Almost 4 G!!! And to fight the wind at the speed at 400 km / H, but another cool thing is that he's the only racers against the American racers in America. 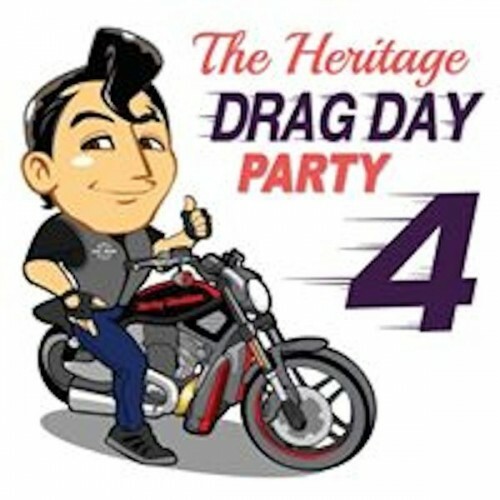 This year, you honor your journey to dragday party. Next year, I want to raise you "Blue Panther" to Thailand. Just bring it to Thai people to see it. Touch a real topfuel car. Hear my voice that I will create a lot of inspiration. A dream when a child. It's starting to be clear. Ask for project. This is successful!!! Next year dragday must be fun. Which company is interested in sponsors, please tell. 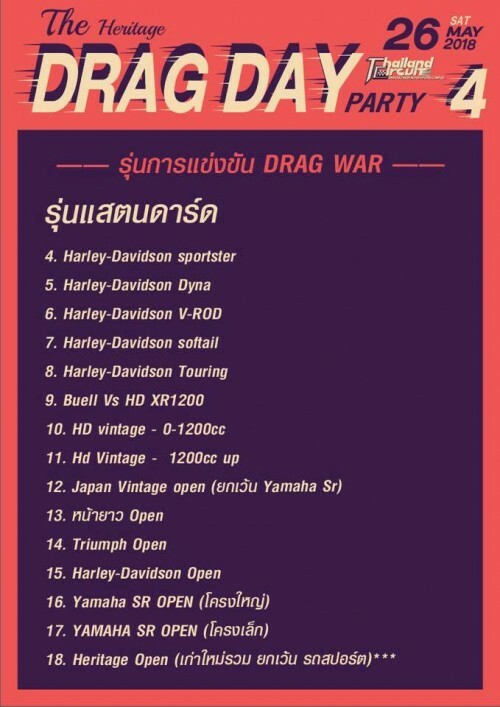 Finally, meet mr. tak shigematsu at booth at the dragday party #4. You come with the best product for Harley-Davidson. Let's get some knowledge.